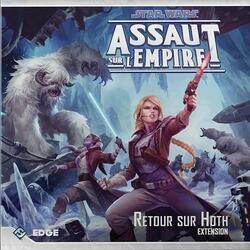 Browse the frozen plains of Hoth in this new expansion for Assault on the Empire! Back to Hoth proposes a new campaign of sixteen unpublished missions that begins in the frantic wake of the Battle of Hoth. Your fierce fight to protect the Rebel refugees will lead you through the Outer Rim, but you will soon find yourself in the abandoned ruins of Base Echo, with a desperate plan to stop the Imperial attack! Three new heroes will join the fight in this expansion, and will work alongside Princess Leia to oppose the Empire's forces, while new items, classes, rewards and shelf tiles will take you deeper into the world. Star Wars adventure. Back to Hoth also features new Action Figures and Cards that will allow each faction to set up exciting skirmish strategies. You'll be able to line up deadly HK assassin droids, elite Imperial snowtroopers, sturdy Echo Base infantrymen or the murderous bounty hunter Dengar. All-new skirmish missions feature snow-covered plateaus, and the new Command Cards will help you lead your troops to victory!